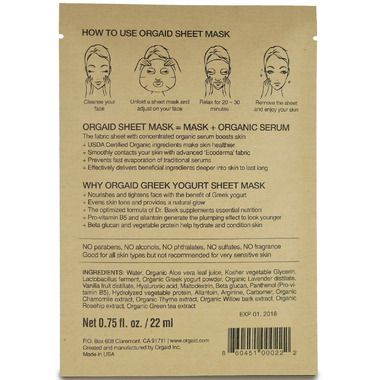 Orgaid's Greek Yogurt & Nourishing Organic Sheet Mask was made for those looking for a safe and healthy skincare product that is convenient and easy to use. With USDA Certified Organic ingredients and no chemical preservatives, this mask contains a concentrated serum that boosts skin. The unique "Ecoderma" fabric uses advanced technology to effectively delivers beneficial ingredients deeper into skin and prevents their evaporation, for visibly hydrated, softer and smoother skin. 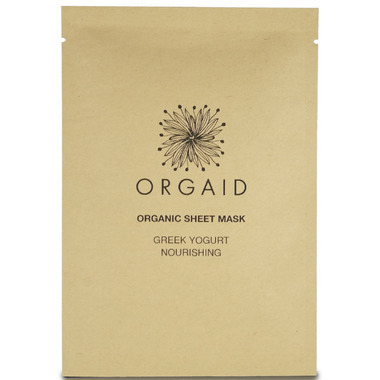 Unfold a sheet mask and adjust on your face. Remove the sheet and enjoy your skin. I absolutely adore these sheet masks. They are super hydrating and definitely improve the texture and appearance of my skin. I love keeping them in the fridge to enhance the treatment even further. I've repurchased many times and would recommend to anyone. When you peel of the mask don't rinse - rub in all that goodness and don't skip your neck! Great from a quick pick me up before an event or to use while travelling. Highly recommend!